Have you ever tried painting with tissue paper? This bleeding tissue paper Earth is perfect for Earth Day. Painting with bleeding tissue paper is a favorite of ours. I am not sure what is more fun, ripping up the pieces of tissue paper or using the spray bottle and watching the colors run. Either way, we love this process. We have made snowflakes for the winter and spooky trees for the fall. The spring is here and Earth Day is right around the corner. This bleeding tissue paper Earth seemed like the perfect craft. We just had our first snowfall here and while the rest of my friends have been grumbling and groaning, I have been celebrating our fall snowfall with snow themed activities. Any excuse for me to make snowflakes is a good one. *The Pinterested Parent is a participant in the Amazon Services LLC Associates Program, an affiliate advertising program designed to provide a means for sites to earn advertising fees by advertising and linking to Amazon.com. In addition, text and image links in this post may be affiliate/referral links, which means we may be compensated if you make a purchase after clicking through these particular links* See full disclosure policy. I love snowflakes. They are so fun to make & since, just like a child, each one is unique, the possibilities are endless. I wanted to show my 4 year old how to draw snowflakes. She loves patterns, so I thought that she would love drawing them as much as I do. I am kind of addicted to snowflake crafts. I love the symmetry and since no two snowflakes are the same, think of all of the design possibilities. I could make snowflakes all day and with all of these wonderful snowflake craft ideas, I really could. There are snowflakes made with paper, snowflakes sewn with yarn, snowflakes made out of hand prints and even snowflakes painted on rocks. Which is your favorite? Summer is only a few short weeks away and our yard is already starting to fill up with the flutter of butterfly wings. Today, we were lucky enough to get to study one resting in our garden. My daughter loves them. She was so excited about seeing that beautiful little butterfly that she wanted to make one later that day. We love working with bleeding tissue. I don’t know if it is the excitement of getting to tear the tissue paper into little pieces or if it is using the squirt bottle that my daughter likes more. Either way, the process is a fun one. Tissue paper is a favorite craft material of ours. There are so many ways that you can use it. You can cut it, tear it and crumple it up to add some color to any project. You can make lovely stained glass or luminaries. If you use bleeding tissue paper, you can even paint with it. The possibilities are endless. Tissue paper is so versatile. Here are over 40 great and inspiring tissue paper craft ideas that you and your kids can make together. Bleeding tissue paper painting is a fun alternative to traditional painting. These bleeding tissue paper shamrocks are a fun and easy St. Patrick’s Day art idea. 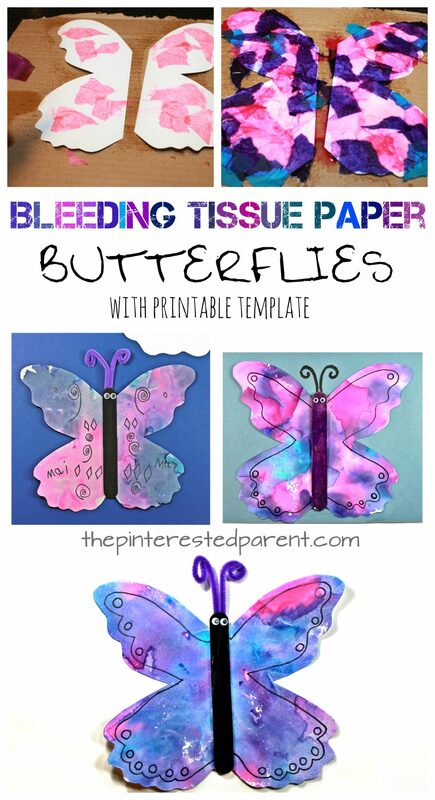 Bleeding tissue paper is one of our favorites ways to paint. It is fun. It is messy and it produces very cool results. We have made a few bleeding tissue projects for Christmas and then Valentine’s Day. With St. Patrick’s Day around the corner, we had to make one for St. Paddy’s, as well. I love these bleeding tissue paper shamrocks because they are so simple. Resist art is wonderful for artists of all ages. From toddlers to adults, it is simple and fun to do. We have used tape, oil, White-out and cardboard to make resist art in the past, but crayon resist I think may be my favorite to do. These crayon resist hearts are perfect for Valentine’s Day and could easily be made into homemade cards. Winter and Christmas are a beautiful and magical time. The snow falling, the twinkling lights from a Christmas tree and even a snowy roof top are great creative inspiration for artists, young and old. My little one and I have greatly enjoyed creating artwork for the season. We have used watercolors, acrylics, tissue paper and newspaper. Here is a collection of some of our favorite art projects. Click on the titles to follow the links to the full tutorials. We are huge fans of making art using bleeding tissue paper. The effect is so lovely and the process is a ton of fun. I don’t know about the rest of you, but I always take great care in picking my wrapping paper each year. I love the look of the wrapped presents under the tree, the shine of the wrapping paper, the patterns and the bows. Christmas gifts are just plain pretty. We are deep into the fall now and the cold weather is here. The leaves are falling and some of the trees are bare now. I love the fall trees, but I also love the haunting beauty that comes with a bare tree, especially against the night sky. We wanted to paint some night skies, but thought that bleeding tissue paper might be perfect for a our haunting scene.